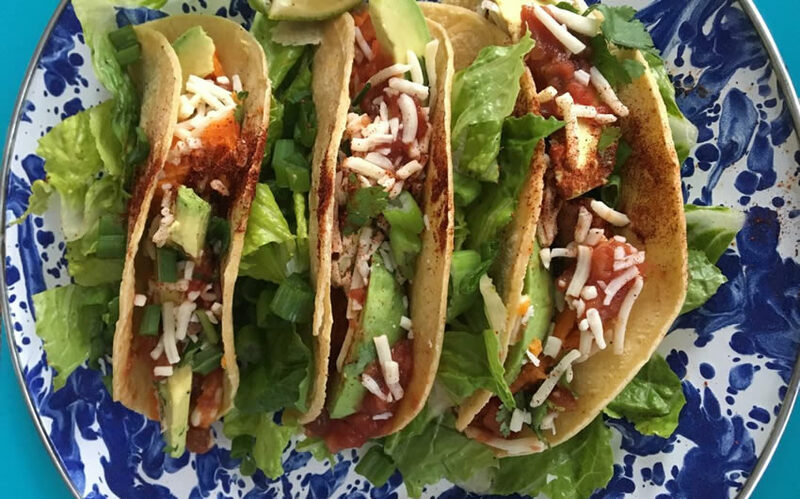 Replacing the meat, with veggies and tempeh, makes these vegetarian worthy tacos healthier and just as delicious as their meaty cousins. 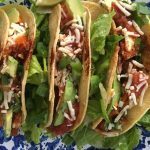 The tempeh lends the meaty texture that is missing in most vegetable tacos and these are pleasing to even the most die hard carnivores. Thank you Thug Kitchen for this terrific recipe. Place onion, pineapple, lime juice, chili powder, liquid smoke, smoked paprika, cumin, and oregano in a food processor or blender and pulse until smooth. Let rest. In a large skillet, warm oil over medium heat. Add tempeh and sauce for 2 minutes, fold in sweet potato and sprinkle with the Bragg’s or soy sauce. Cook 3-5 minutes until sweet potato softens. Pour the sauce from step 1 over the tempeh and sweet potato mixture and cook 3 minutes stirring gently. Warm the tortillas and then fill ⅓ full with tempeh and sweet potato mixture and garnish with toppings of choice. For another plant-based entreé idea that’s a bit unique, try my Miso Glazed Japanese Eggplant recipe.